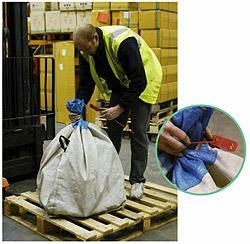 Maxi JawLock is an easy to use, tamper evident security seal with a secure locking mechanism. It is stronger (4mm width) and longer than the standard Jawlock. Stainless steel spring locking mechanism. Very easy to use - kind to the hands. Higher security - reduced losses. Range of colours for improved colour coded security and efficiency. Tear off option allows quick & easy tool free release. (Other sizes available in 'Jawlock' & 'Mini Jawlock' formats). Stock items preprinted with logo/text & sequential numbering. Custom printing available with name/logo, number and/or barcode. Standard colours - Red, Yellow, Blue, Green, Orange and White. Contact us for other colours. -20˚C to 60˚C (-4˚F to 140˚F).